CM Magazine: Animal Heroes: 27 True Stories. Animal Heroes: 27 True Stories. Grades 3-9 / Ages 8-14. The Grand Marshall of the Edmonton Santa Claus Parade in 1994 wore a dark grey coat. He was small, with curly hair. His name was Freddy; he was a hero, and he was a dog. He had saved his owner Sylvia Burnette's life in a most unusual way. 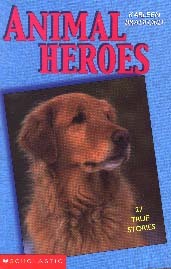 The cover page of Animal Heroes carries a sentence that reads, "Some of the material in this book was previously published in Animal Heroes and More Animal Heroes." A more accurate statement would have begun with the wording, "Most of the material in this book was previously published..." for the 13 stories of the 1995 publication and 14 from the 1996 volume constitute the "27 True Stories" of the present work. My noting that the content of Animal Heroes is largely reprinted material is not to be interpreted as a criticism, however, and Scholastic should be applauded for making these two works available again within a single volume, especially since heroes, animals and medals are all continuing topics of interest to young readers. In 1999 a 5-year-old rottweiler police dog named Caesar leapt into the path of a bullet, when he tried to disarm a man threatening a schoolyard full of children. Caesar later died of his wounds, but not before his partner Constable Randy Goss and other officers captured the man. Caesar was awarded the Ralston Purina Service Dog of the Year award. Perhaps it is not surprisingly that 22 of the animal heroes are dogs, but Bradford's stories also include three cats, a rabbit and a polar bear. Many of the heroic dogs are "working" canines like Ewo, a German Shepherd, who was part of the Niagara Regional Police Force Canine Team, but others, including Wrinkles, a Dachshund, who defended his owners from an armed intruder, are just household pets. The term, "heroes," is used not only in the traditional sense of someone who performs an act which involves a risk of life, but also in a "softer" sense. The actions of Grizzly, a Siberian Husky, who fought a black bear that was attacking his owner exemplify the more standard understanding of hero while Tuk, the zoo polar bear who rescued a kitten from his enclosure's pool and then prevented it from becoming a snack for the other bears, represents the other meaning. One of the strength's of Bradford's writing is that she does not just present the details of the particular heroic occurrence, but she nests the event within a larger context so that readers get a real feel for the people and the animals. With the exception of heroic incidents connected with specific historical happenings, like World War II ("The Rabbit Who Joined the Navy") or the civil war in China in the late 1940's ("Simon: The Ship's Cat"), stories are generally undated, an approach which extends the book's shelf-life. Dave Jenkinson, while awaiting acts of bravery by his cockatiels, teaches courses in YA literature in the Faculty of Education, the University of Manitoba.